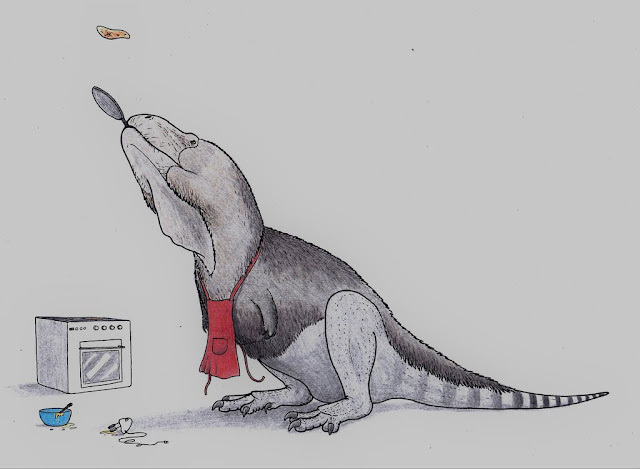 Like undergraduate students everywhere, you lot submitted a flurry of entries for our Tyrannosaur Chronicles competition right before the deadline. But no matter! You still got in. While the final six winners will ultimately be decided by us, I thought (as with previous competitions) it'd be fun to put up a gallery of all the entrants and gather some of your opinions before we dole out the books. So, in no particular order, here's a gallery of T. rex...TRIUMPHING! 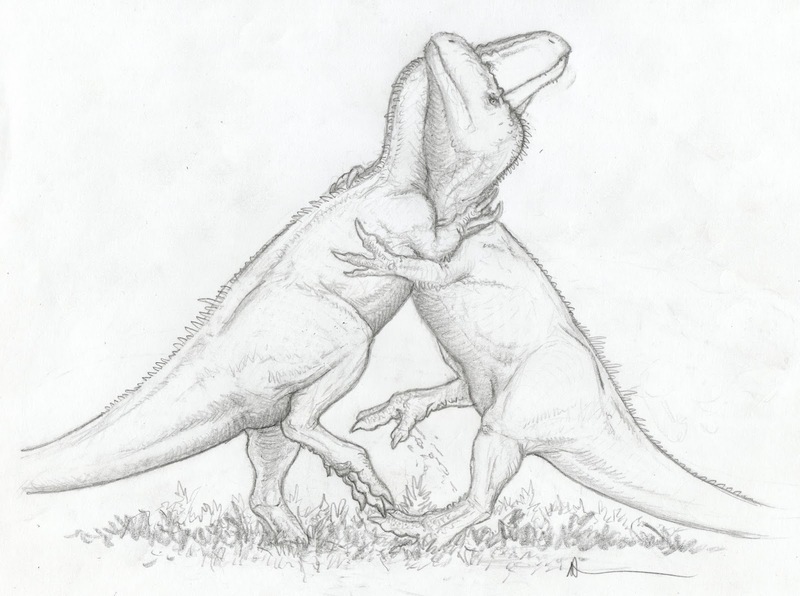 Two new ceratopsid taxa debuted simultaneously in PLoS One recently. 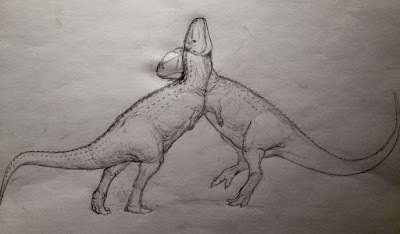 Meet the new centrosaur Machairoceratops cronusi and new chasmosaur Spiclypeus shipporum, AKA Judith. 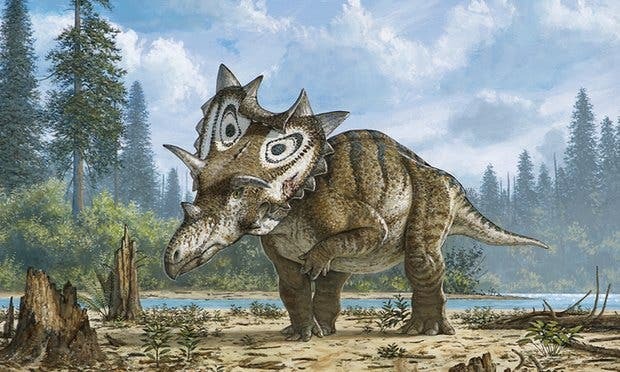 Machairoceratops joins Diabloceratops as the second ceratopsid described from the Upper Cretaceous Wahweap Formation (though the two did not overlap in time), while Spiclypeus hails from farther north in the Judith River Formation. Read more on both from Liz Martin-Silverstone. Spiclypeus is the subject of a gaffe by one science news site, which noted that the dinosaur "sported beautiful coloring akin to butterfly camouflage." 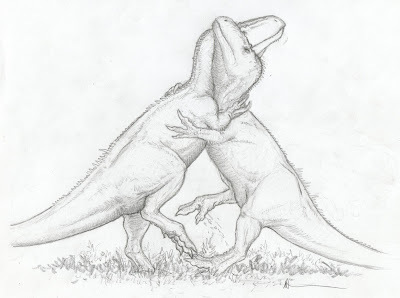 Not everyone groks that paleoart relies on speculation and inference, I suppose. Maybe Mike Skrepnick's beautiful restoration is just that persuasive. 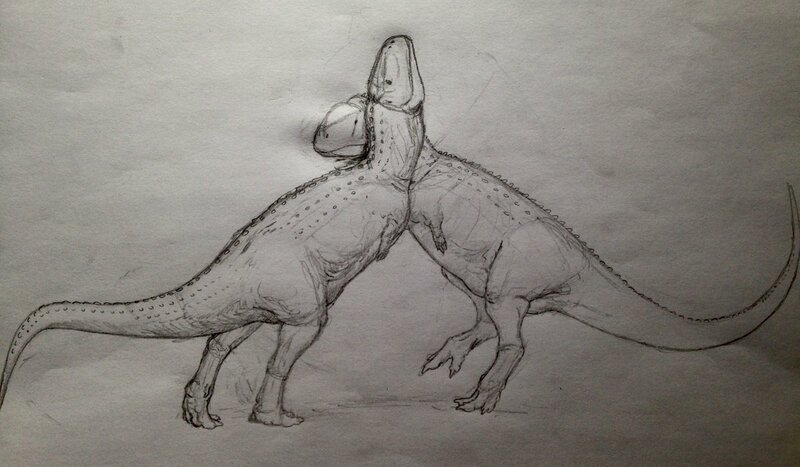 Speaking of paleoart, see also Mark Witton's Machairoceratops and Brett Booth's Spiclypeus. 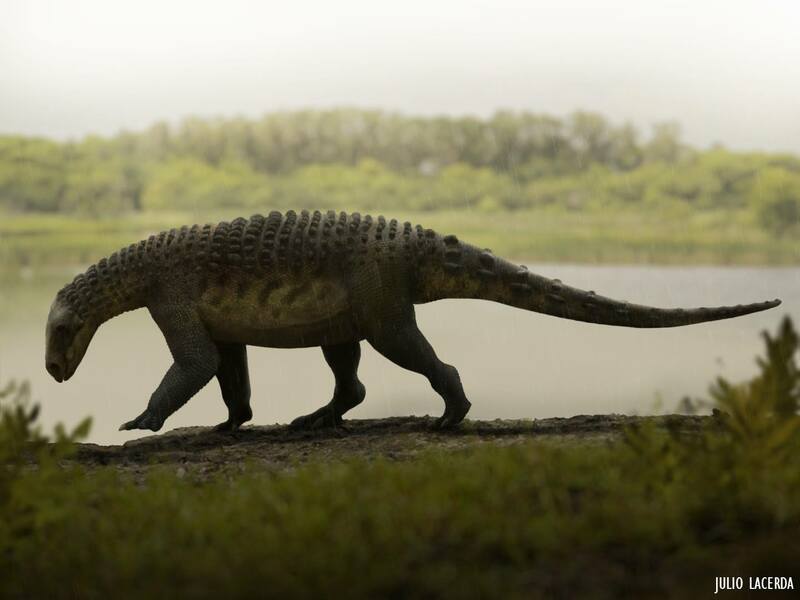 Recent research into Pawpawsaurus published by PLoS One looked inside the early Cretaceous nodosaurid's noggin to study its sensory capabilities. Read more at Earth Archives and Everything Dinosaur. Jack Horner has retired from the Museum of the Rockies. The museum bid him farewell with a big public party, at which folks could check out field equipment and meet field crews. Good luck in retirement, Jack! Mark Witton trains a skeptical eye on the popular theory that Protoceratops was the origin of the griffin myth. 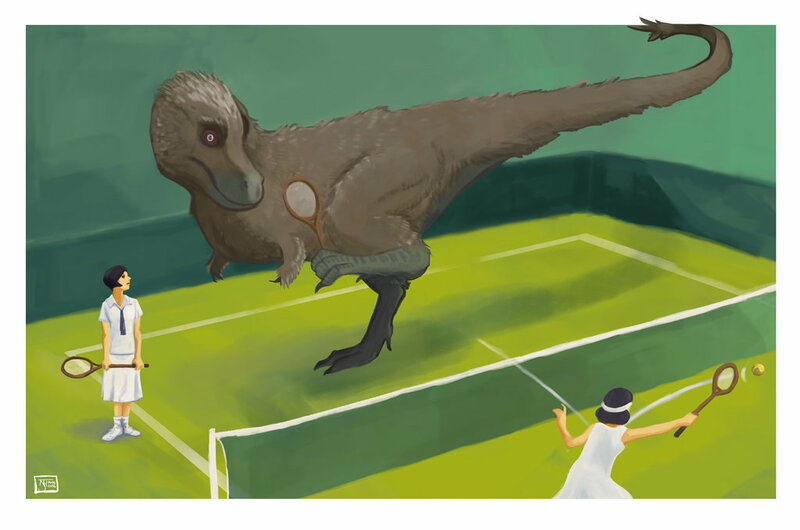 Meet Dr. Marina Suarez, who along with her twin sister is namesake of Geminiraptor suarezarem. 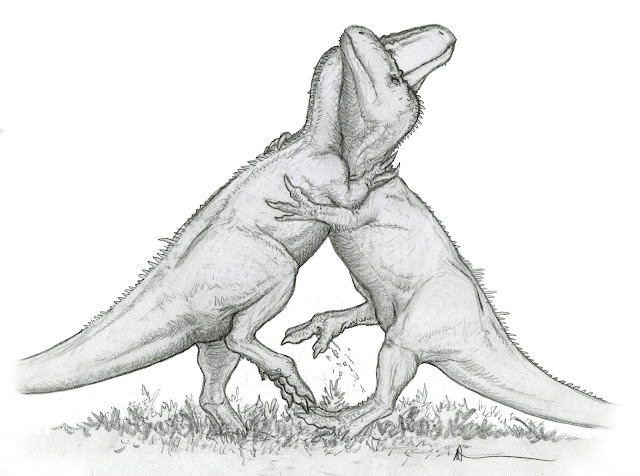 At Inverse, Jaqueline Ronson profiles one John Conway, a paleoartist of note. Emily Willoughby tells the amazing story of the avian eye at GotScience. Brian Switek and Laelaps have a new home. You can now read his excellent work at Scientific American. Tails and wing feathers were in Matt Martyniuk's crosshairs at DinoGoss recently. He discusses the repeating meme of giving Microraptor-style tail fans and Caudipteryx-style mini-wings to feathered dinosaurs that probably would have looked more like Archaeopteryx, with lozenge-shaped tails and large wings. Not the end of the world but I'd probably rework a dromie I drew last year if I could. Here's Scott Potter of Thagomizers on... the world of Awesomebro. Well, there certainly has been a lot going on since the last time I had the time to do one of these! We've seen Beasts of the Mesozoic and Saurian destroy their funding goals, providing more evidence that there is a decent market for scientifically-minded dinosaur media. While the BOTM campaign is closed (finishing with enough money to greatly expand the original set of raptors), Saurian still has a few weeks. They've passed the "Post-impact Survival Mode" stretch goal, and it's certainly conceivable that they'll hit more of them. Head over to check out the pledge levels if you haven't already. 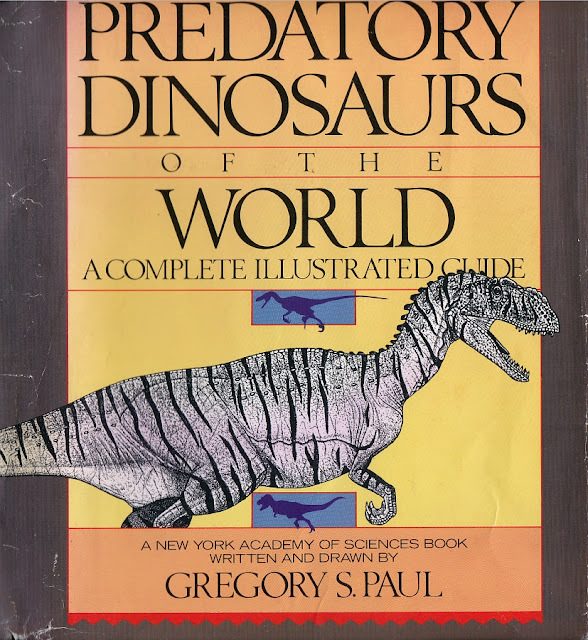 I'm really excited about their field guide book, which is employing many paleoartists to illustrate the world of Saurian. Meanwhile, on the research side of things, there have been a nice batch of recently funded paleo projects at Experiment. One that needs support now is Dean Lomax's effort to track down errant British ichthyosaurs in American museums. As Dean says, "This project will enable me to complete my ongoing study revising the genus, something that has been required for a very long time. Some specimens have been examined by a colleague but in order to critically evaluate them we must examine and assess eachothers findings together – like good scientists should!" The deadline is June 19, so hop to! Pawpawsaurus gets the nod here, and not just because the generic name reminds me of a certain smelly native tree 'round my parts. I just love Julio Lacerda's reconstruction, head down in mid-sniff on a rainy evening - perhaps getting a nice whiff of Actinomycetes. 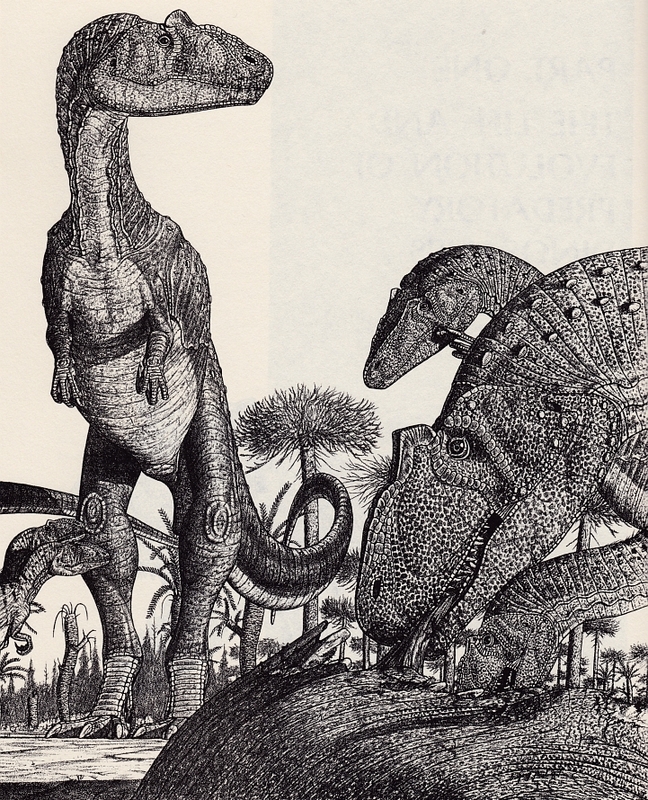 Pawpawsaurus by Julio Lacerda, used here with the artist's permission. It is widely documented - not least by this blog - that a very few popular dinosaur books published over the last century stand out as real 'landmarks'. 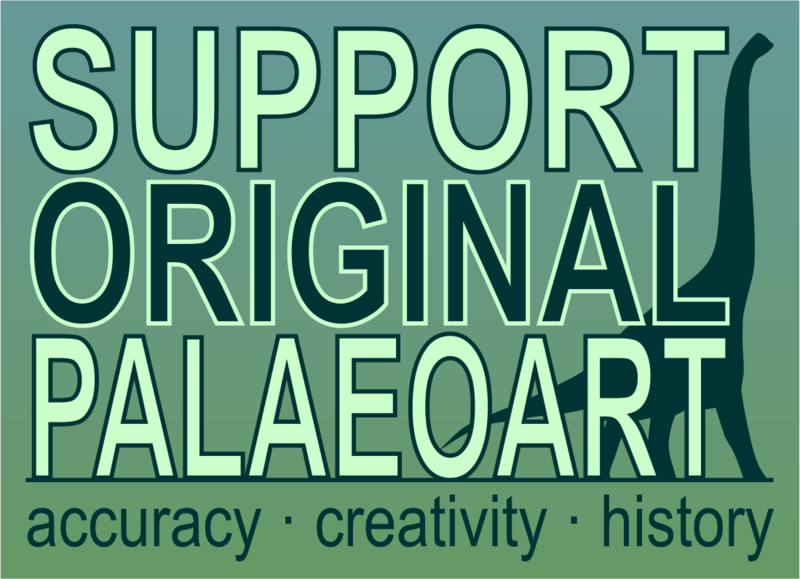 Books that are incalculably influential, for good or ill (and often a bit of both), giving rise to countless copycats and wannabes and spreading peculiar styles and memes far and wide in the world of palaeoart. Greg Paul's infamous Predatory Dinosaurs of the World is undoubtedly one such book, arguably doing more to spread the Paulian style than any other of his works. It's so well known that, for a long time, it seemed like a bit of a waste of time covering it; surely it's already been done to protofeathered death? I'm glad I changed my mind.